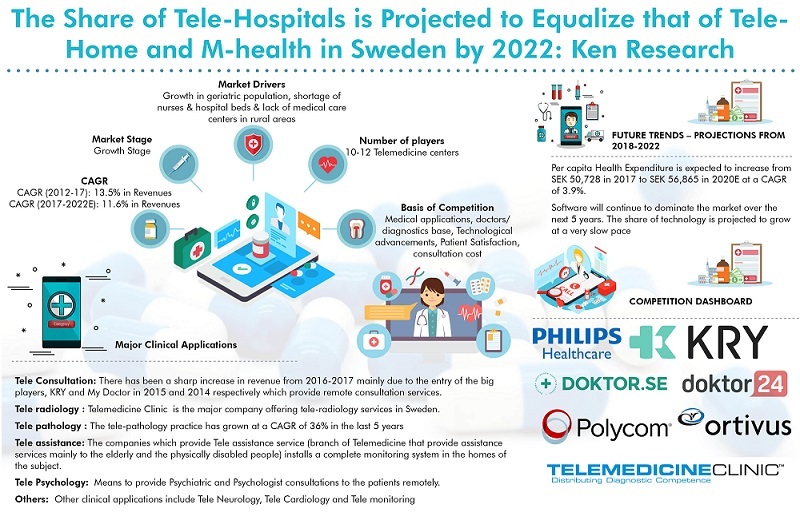 The report titled “Sweden Telemedicine Market Outlook to 2022 – By Technology (Software and Hardware) and By Services (Service Platform-Tele Hospitals & Clinics, Tele Home and M-Health and By Clinical Application -Tele Consultation, Tele Radiology, Tele Assistance, Tele Pathology, Tele Psychology and Others)” provides a comprehensive analysis of the status of telemedicine services and technology market in Sweden. The report focuses on telemedicine services market by Clinical application (Tele Consultation, Tele radiology, Tele Assistance, Tele Pathology, Tele Psychology and Others), by service platform (Tele Hospitals and Clinics, Tele Home and M-Health). The report also covers the overall competitive landscape of major Telemedicine companies including (KRY, My Doctor, Doktor.se, Telemedicine Clinic, Ortivus and other); government role and regulations, value chain analysis, growth drivers, trends and developments. The report concludes with market projection and analyst recommendations highlighting the major opportunities and cautions. The report is useful for telemedicine service centers, telemedicine hardware manufacturers, telemedicine software developers, hardware distributors, potential entrants and other stakeholders to align their market centric strategies according to ongoing and expected trends in the future. In terms of revenue, the Telemedicine market within Sweden has registered a steady growth trajectory witnessing a positive CAGR in last five years (2012-2017). Growth was majorly due to entry of new players, increase in the elderly population and acute shortage of nursing and hospital beds in Swedish hospitals. In terms of value, Sweden Telemedicine market size has increased by more than 80% in terms of revenue from 2012 to 2017. Moreover, owing to the increased awareness regarding telemedicine services, increased product innovation in the market, expanding services portfolios of major players and aggressive marketing & sales strategies have helped the market to grow and expand during the review period. Technology and Services: Services have continued to dominate the revenue share of telemedicine market since 2012. However, the share of services has been declining relative to technology. Services accumulated more than double the share of technology in 2017. By Services: It was witnessed that in the market segment by service platform, Tele-Hospitals and Clinics have dominated the market size since 2012; however its share in the revenue has fallen relative to Tele-Home and M-Health in 2017. By Clinical applications, Tele Consultation and Tele Radiology have acquired equal share in 2017, however, Tele radiology has dominated the market since 2012. The share of tele assistance has increased from 2012-2017 but at a very slow pace. Tele Pathology and Tele Psychology constitutes the lowest share in the market. Other clinical applications such telepsychology, teleneurology, telemonitoring have contributed the remaining share. By Technology: Amongst telemedicine technology, telemedicine market has been dominated by revenue generated through software by almost more than double. Major services are extended through cloud based delivery model. In Sweden, there are 10-12 Telemedicine centers. The market has largely been fragmented due to the fact that all major telemedicine centers provide varied type of services. However, there is no major center dominating the market share in the country. Major players include KRY, My Doctor, Doktor.se, Doktor24, DocOnNet and Telemedicine Clinic. Philips Healthcare, Polycom and Ortivus. Ortivus, Polycom and Philips Healthcare are the major ICT and Hardware providers in the Telemedicine Market in Sweden. Sweden Telemedicine Market has been anticipated to showcase a sound growth at a CAGR of close to 12% during the forecast period of 2017-2022. The growth during this period is expected to be supported by growing elderly population, increasing shortage of nursing staff and hospital beds, increasing number of smartphone users, increasing number of general practitioners and expansion in the number of clinical applications of telemedicine services in Sweden.